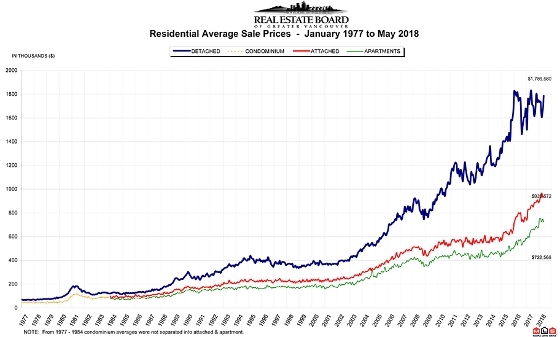 The Real Estate Board of Greater Vancouver (REBGV) reports that residential home sales in the region totalled 2,425 in June 2018, a 37.7 percent decline from the 3,893 sales recorded in June 2017, and a 14.4 percent decrease compared to May 2018 when 2,833 homes sold. Last month’s sales were 28.7 percent below the 10-year June sales average. There were 5,279 detached, attached and apartment properties newly listed for sale on the Multiple Listing Service® (MLS®) in Metro Vancouver in June 2018. This represents a 7.7 percent decrease compared to the 5,721 homes listed in June 2017 and a 17.2 percent decrease compared to May 2018 when 6,375 homes were listed. The total number of homes currently listed for sale on the MLS® system in Metro Vancouver is 11,947, a 40.3 percent increase compared to June 2017 (8,515) and a 5.8 percent increase compared to May 2018 (11,292). This is the highest this total has been since June 2015. For all property types, the sales-to-active listings ratio for June 2018 is 20.3 percent. By property type, the ratio is 11.7 percent for detached homes, 24.9 percent for townhomes, and 33.4 percent for condominiums. The MLS® Home Price Index composite benchmark price for all residential properties in Metro Vancouver is currently $1,093,600. This represents a 9.5 percent increase over June 2017 and is virtually unchanged from May 2018. Sales of detached homes in June 2018 reached 766, a 42 percent decrease from the 1,320 detached sales recorded in June 2017. The benchmark price for a detached home is $1,598,200. This represents a 0.7 percent increase from June 2017 and a 0.6 percent decrease compared to May 2018. Sales of apartment homes reached 1,240 in June 2018, a 34.9 percent decrease compared to the 1,905 sales in June 2017. The benchmark price for an apartment is $704,200. This represents a 17.2 percent increase from June 2017 and a 0.4 percent increase compared to May 2018. Attached home sales in June 2018 totalled 419, a 37.3 percent decrease compared to the 668 sales in June 2017. The benchmark price of an attached home is $859,800. This represents a 15.3 percent increase from June 2017 and is virtually unchanged from May 2018. The Real Estate Board of Greater Vancouver (REBGV) reports that residential property sales in the region totalled 2,579 in April 2018, a 27.4 percent decrease from the 3,553 sales recorded in April 2017, and a 2.5 percent increase compared to March 2018 when 2,517 homes sold. There were 5,820 detached, attached and apartment properties newly listed for sale on the Multiple Listing Service® (MLS®) in Metro Vancouver in April 2018. This represents an 18.6 percent increase compared to the 4,907 homes listed in April 2017 and a 30.8 percent increase compared to March 2018 when 4,450 homes were listed. The total number of properties currently listed for sale on the MLS® system in Metro Vancouver is 9,822, a 25.7 percent increase compared to April 2017 (7,813) and a 17.2 percent increase compared to March 2018 (8,380). For all property types, the sales-to-active listings ratio for April 2018 is 26.3 percent. By property type, the ratio is 14.1 percent for detached homes, 36.1 percent for townhomes, and 46.7 percent for condominiums. The MLS® Home Price Index composite benchmark price for all residential properties in Metro Vancouver is currently $1,092,000. This represents a 14.3 percent increase over April 2017 and a 0.7 percent increase compared to March 2018. Sales of detached properties in April 2018 reached 807, a 33.4 percent decrease from the 1,211 detached sales recorded in April 2017. The benchmark price for detached properties is $1,605,800. This represents a 5.1 percent increase from April 2017 and a 0.2 percent decrease compared to March 2018. Sales of apartment properties reached 1,308 in April 2018, a 24 percent decrease from the 1,722 sales in April 2017. The benchmark price of an apartment property is $701,000. This represents a 23.7 percent increase from April 2017 and a 1.1 percent increase compared to March 2018. Attached property sales in April 2018 totalled 464, a 25.2 percent decrease compared to the 620 sales in April 2017. The benchmark price of an attached unit is $854,200. This represents a 17.7 percent increase from April 2017 and a 2.3 percent increase compared to March 2018. 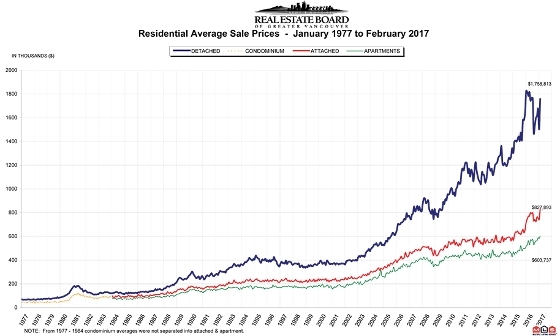 VANCOUVER, BC – March 2, 2017 – Reluctance amongst Metro Vancouver* home sellers is impacting sale and price activity throughout the region’s housing market. Residential home sales in the region totalled 2,425 in February 2017. This is a 41.9 percent decrease from the record 4,172 homes sold in February 2016 and an increase of 59.2 percent compared to January 2017 when 1,523 homes sold. Last month’s sales were 7.7 percent below the 10-year February sales average. New listings for detached, attached and apartment properties in Metro Vancouver totalled 3,666 in February 2017. This represents a 36.9 percent decrease compared to the 5,812 units listed in February 2016 and an 11.4 percent decrease compared to January 2017 when 4,140 properties were listed. The total number of properties currently listed for sale on the Multiple Listing Service® (MLS®) in Metro Vancouver is 7,594, a four per cent increase compared to February 2016 (7,299) and a 4.9 percent increase compared to January 2017 (7,238). The region’s sales-to-active listings ratio for February 2017 is 31.9 percent, a 10-point increase from January. Generally, analysts say that downward pressure on home prices occurs when the ratio dips below the 12 percent mark for a sustained period, while home prices often experience upward pressure when it surpasses 20 percent over several months. “While home sales are not happening at the pace we experienced last year, home seller supply isstill struggling to keep up with today’s demand. This is why we’ve seen little downward pressure on home prices, particularly in the condominium and townhome markets,” Morrison said. The MLS® Home Price Index composite benchmark price for all residential properties in Metro Vancouver is currently $906,700. This represents a 2.8 percent decrease over the past six months and a 1.2 percent increase compared to January 2017. Sales of detached properties in February 2017 reached 745, a decrease of 58.1 percent from the 1,778 detached sales recorded in February 2016. The benchmark price for detached properties is $1,474,200. This represents a 6.5 percent decrease over the past six months and is unchanged compared to January 2017. Sales of apartment properties reached 1,275 in February 2017, a decrease of 28.8 percent compared to the 1,790 sales in February 2016.The benchmark price of an apartment property is $526,300. This represents a 2.3 percent increase over the past six months and a 2.7 percent increase compared to January 2017. Attached property sales in February 2017 totalled 404, a decrease of 33.1 percent compared to the 604 sales in February 2016. The benchmark price of an attached unit is $675,500. This represents a 0.3 percent decrease over the past six months and a 1.3 percent increase compared to January 2017. The sky is not falling...and other news about the Vancouver real estate market. One month after introduction of the infamous 'foreign buyer tax' we're seeing a market that appears to be returning to stability after some frenetic-paced years (ok, let's just say it: CRAZY). As expected, Vancouver real estate sales were down in August compared to August 2015 in all categories: detached, townhouses, and apartments (condos). The number of detached sales were down 45%, townhomes -25% and condos -10%. Prices are still rising though, although at a slower pace, both year over year AND over the past 3 months. 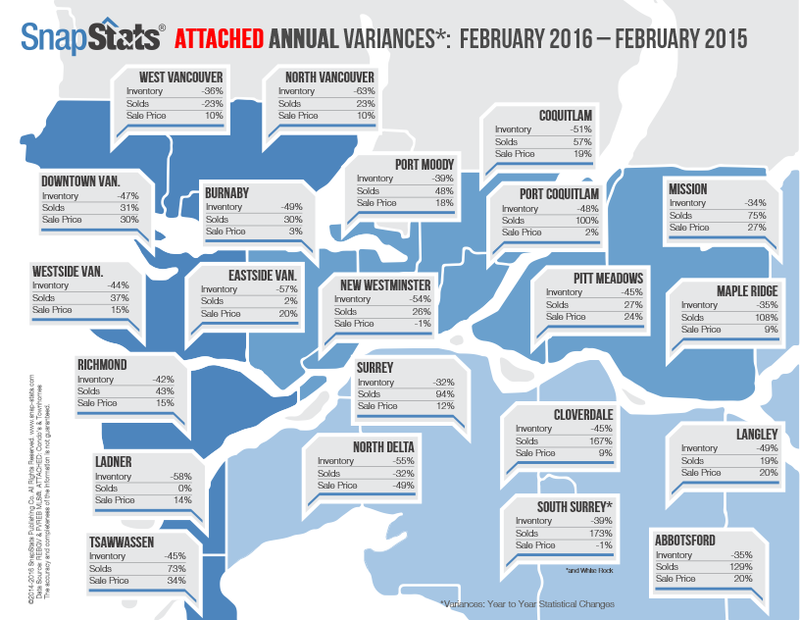 Vancouver detached prices are up 36% year over year and 4% over the past 3 months. Vancouver townhomes are +31% and +7% respectively, while condos prices are up +27% for the year and +6% over 3 months. Kitsilano 1/2 duplex for sale. Escape the heat and come visit our Open House at 2360 Waterloo on Saturday August 20th 2 to 4. This gorgeous Kits 1/2 duplex offers a completely renovated interior and exceptional outdoor space - and it's really private! See you tomorrow! Home buyers remain active in Metro Vancouver real estate. 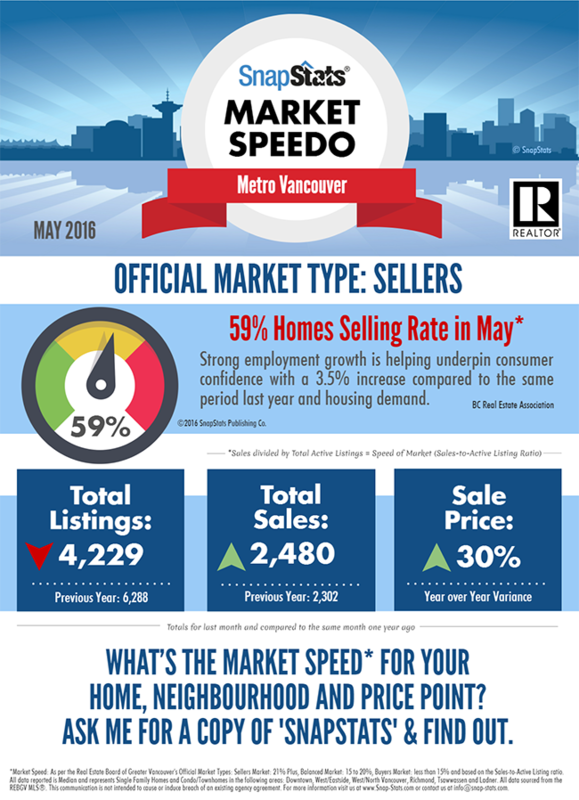 Snapshot of Vancouver real estate May 2015 - May 2016. Great upside in this Mount Pleasant condo! Exercise your talent as a renovator with this spacious Mt. Pleasant condo for sale at 440 E. 5th! Great bones, sunny outlook, super quiet. See you at the Opens: Sat 28th 2 - 3 and Sun 29th 2 - 4. UPDATED May 28th: please note OPENS CANCELLED. VANCOUVER, BC – Last month was the highest selling April on record for Metro Vancouver* and were 41.7% above the 10-year sales average for the month. And we've seen some pretty good April's over the past 10 years! Residential property sales totalled 4,781 in April 2016, up 14.4% from the 4,179 sales recorded in April 2015 and down 7.6% compared to March 2016 when 5,173 homes sold. Vancouver real estate market variance by neighbourhood. This chart shows the annual variances for attached properties in the various of the Vancouver real estate market. It includes Vancouver condos, townhomes, and Vancouver 1/2 duplexes. The price change ranges from minus 49% in North Delta to a high of +30% for downtown Vancouver attached properties and +34% in Tsawwassen. 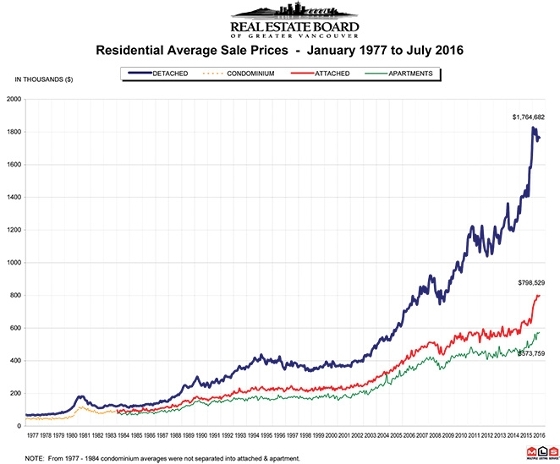 Posted in: Vancouver real estate market monthly overview. Home buyer activity remains at near record levels across the Metro Vancouver real estate market. Residential property sales in Greater Vancouver totalled 2,519 in January 2016, an increase of 31.7% from sales recorded in January 2015 and a 10.9% decline compared to December 2015 when 2,827 home sales occurred. Last month’s sales were 46% above the 10-year sales average for the month and rank as the second highest January on record. 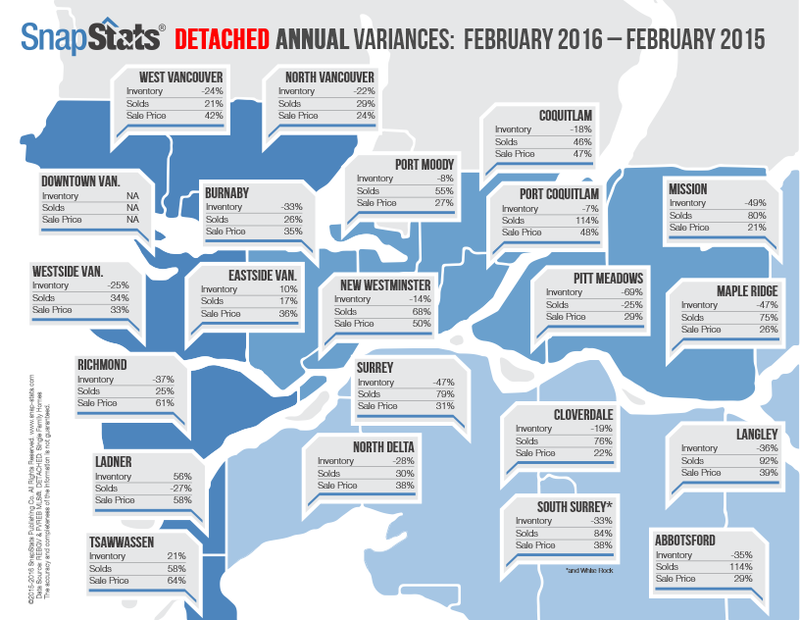 New listings for detached, attached and apartment properties in Greater Vancouver totalled 4,442 in January 2016 - down 6.2% decline compared to January 2015 and a 120% percent increase compared to December 2015. The total number of properties currently listed for sale on the MLS® system in Metro Vancouver is 6,635, a 38.6% decline compared to January 2015 (10,811) and a 10% increase compared to December 2015. The sales-to-active listings ratio for January 2016 is 38%. This is indicative of a seller’s market. Generally, downward pressure on home prices occurs when the ratio dips below the 12% mark, while home prices often experience upward pressure when it reaches the 20 to 22% range for a sustained period of time. Sales of detached properties in January 2016 reached 1,047, an increase of 34% from detached sales recorded in January 2015. The benchmark price for detached properties increased 28% from January 2015 to $1,293,700. Sales of apartment properties reached 1,096 in January 2016, an increase of 35.5% compared to January 2015.The benchmark price of an apartment property increased 19.4% from January 2015 to $456,600. Attached property sales in January 2016 totalled 376, an increase of 16.4% compared to January 2015. The benchmark price of an attached unit increased 16.4% from January 2015 to $563,700.